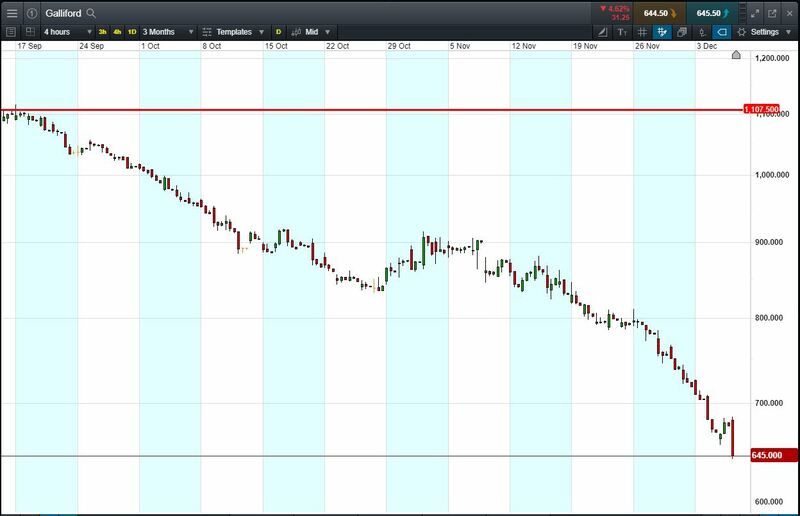 Will Galliford Try turn, or will it continue to fall to November 2012 lows of 594p? The chart shows the Galliford Try price action since mid-September. Shares in a 10-week downtrend from 1107p September highs; now at 645p. 7 Nov: Construction company said it expects an additional £20 in costs related to its troubled Aberdeen Western Peripheral Route road project. In the last 3 weeks, the shares have fallen over 24%. Will this negative momentum continue? Let’s say the trend appeals to you, you think it’s likely to continue. You decide to sell short exposure to £10,000 worth of Galliford Try using a CFD, at the current price of 645p. To do this, you need £2,000. Let’s assume the Galliford Try trend continues to November 2012 lows of 594p (-7.9%). Your profit would be £790, from your initial investment of £2,000. Conversely, let’s assume you open the above position, and place a stop-loss at 3% from the current price. Galliford Try rises 3% and hits your stop-loss. Your loss would be £300.